A visual spectacle and an emotional masterpiece, Alfonso Cuaron’s Gravity takes off as one great 3D movie a film enthusiast will definitely love. Only a handful of movies gave me real goosebumps while watching them: Titanic, Avatar, Inception, Avengers and Life of Pi are some of these. I’d like to add to this list this space drama film. 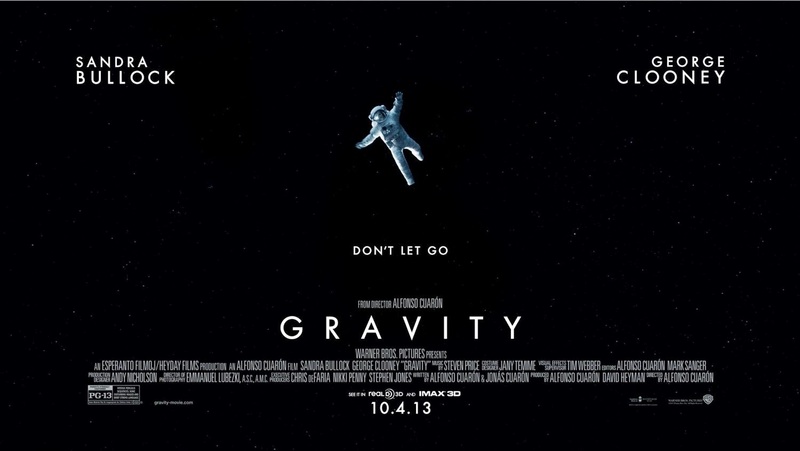 Gravity is about space mission specialist Dr. Ryan Stone (Sandra Bullock) and her struggles to survive after a mishap involving a Russian satellite destroyed her crew’s space shuttle called Explorer. Distressed and panic-stricken while tumbling in outer space, she was accompanied and guided by team commander and veteran astronaut Matt Kowalski (George Clooney) towards a plan to salvage their lives. But their plan to salvation won’t be easy, as communication from mission control on Earth was lost, dangers inside damaged space shuttle loom and threats of high-speed debris till lurk their every action. Well, maybe I am exaggerating a little. But I’m not exaggerating when I say that I felt how heavy the film is. Its theme about life, of living and learning to let go might sound like a cliché when heard, but when the heart is the one listening, it will certainly cut deep and touch your heart. It doesn’t matter if you carry something heavy in your heart while watching. What matters is that the film is capable of doing just that: touching what’s needed to be touched. Sandra Bullock displayed a tour-de-force acting in the film. Her character’s weak and soft side would make the audience either worried or irritated (I felt both at different times). But when she’s began to come to her senses, you’ll certainly see her drive to do what she has to do. George Clooney was very good as the cool and ingenious space mission commander. However, we know that he’s always really good when portraying these kinds of characters. I wish to see him portray opposites of these roles. Here’s hoping for more great 3D movies like Gravity. The price people have to pay for these movies in IMAX are definitely worth it. I had high hopes for the remake of this Stephen King story ever since it was reported to be done with Chloë Grace Moretz in the title role. She’s done a lot of great movies even at a young age and she was praised in each and one of them. It also didn’t hurt that Julianne Moore, a seasoned actress who made impressions with her previous movies Hannibal and The Hours, was cast for the role of Carrie’s mother. I have guessed that they would have a good chemistry as the problematic mother-daughter pair in this movie. And I was not wrong. Chloë Grace Moretz lived up to her famous role as Carrie White, a high school outcast who found comfort in her psychic abilities and hope in the hands of a few, good people. Her eyes made the audience feel her shyness and naivety at the start of the movie. The very same eyes made them uneasy during her vengeance to the people who wronged her towards the end. Julianne Moore held her own as the crazed ultra-religious mother of Carrie, making the audience cringe with her self-injurious behaviors and abominable hatred against her daughter. Beside Moretz and Moore, a couple of actors in the supporting cast were good. Judy Greer displayed both toughness and softness with her role as the gym school teacher who looked after Carrie in school. Ansel Elgort, the school’s Alpha guy, was endearing as Chloe’s date in the prom night. Portia Doubleday whose wicked acts and ways made the audience hating her all throughout the screening of the movie, was very effective as the villainous classmate of Carrie. I’ve seen the original and with today’s advanced technologies I thought many aspects of the story that require special effects could be enhanced in many ways. However, the movie has only fairly achieved in this aspect. 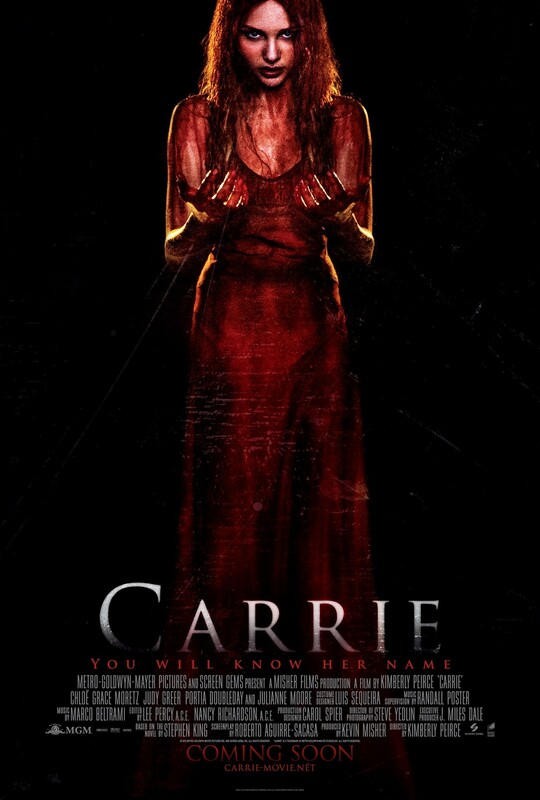 While striking awe at times, the special effects displayed when Carrie was using her powers could have made a better mark. Kimberly Pierce, the movie’s director, could have used these visual effects to inspire awe and wonder to the audience. But she was not able to do so, thanks to uneven editing and seemingly uninspired directing. With many American horror films banking on the obsession of today’s youth in hyper-sexuality and pop culture, the movie has teased some skin, insinuated wild intentions and mentioned a lot of pop culture references. It would be a good guess that this was one way the director wanted the movie to be relevant. She succeeded in a way, but ultimately failed. I understand that she has a lot on her shoulders doing a remake of a beloved horror classic but she was lost in trying to put her own footprint in this movie. It felt like the movie tried to be so many things all at the same time. The director may have wanted to retain the good of the original while trying to be so relevant. The result was a coercion that did not pan out smoothly. There were potentials for some scenes to achieve greatness status and yet each one was drained due to lack of amazing wow factor. I had goosebumps while watching the original but in this movie, I almost always had one but came short every single time. It’s surprising to know that this movie, which is titled after our country’s capital, is helmed, written and produced by Sean Ellis, a British director. The cast is all-Filipino and the setting is none other than places in the Philippines. But not only that, the United Kingdom chose this as their entry to Academy Awards’ Best Foreign Language category! What I’ve seen in this movie reflects the reality that we face in our country today. People who find it too hard to thrive in the provinces try out their luck in the metropolis without knowing the dire consequences that they could face while being in the city. 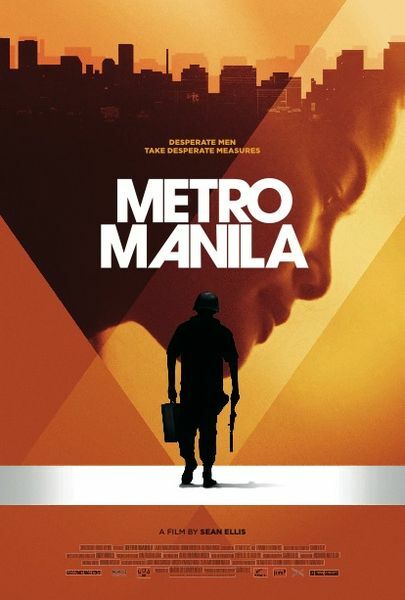 The story of Metro Manila centers on Oscar Ramirez (Jake Macapagal) and his family who decided to escape the hardships they encounter in the northern part of the country. Hopeful yet uncertain about what lies ahead, they went to Metro Manila. It’s not long enough before they fall victims to the city’s corrupt and manipulative system. However, Oscar found hope when he landed a job as an armored truck driver/ courier. Little did he know that his life will change right after. The movie is able to truly capture the city streets’ gripping everyday situation. I am awed to learn that the people behind the movie did not hire a Filipino writer to pen the screenplay. Instead, they wrote it in the English language and asked the Filipino actors to speak their dialogues out according to what they understood in each scene. And what came out was a brilliant and realistic script. There are many outstanding shots in the film, whether they show squalor or splendor. The backdrop in the early part of the film ably captured the tranquil and simple life in the countryside. Meanwhile, the setting in the city totally reflected the untidy and harsh realities of the city. Such contrasting situations made a great effect not just to the eyes that see, but also the minds that ponder. The audience won’t be able to resist reflecting about what they have just watched. And it would be up to them to act upon what they have learned. This movie is sad and tragic right from the start. There are only a few movies that I have watched that’s downright depressing and this is one of them. But it doesn’t stay that way all throughout. Glimpses of hope and promise to a life of hardships can be seen in the unfolding stories of the characters. The quick transition of their lives from a clean and simple one to a filthy and complicated one, though, has its consequences. The scenes that captured this change are praise-worthy, much like the soaring climax that ended a steady yet not boring story-telling. And wait until the satisfying end, which hits a good mark after everything that happened. The cast of the movie is great. Jake Macapagal is very believable as Oscar Ramirez, a simple and caring husband/father who would do anything for the sake of his family. Althea Vega is always into her element as Oscar’s wife, who decided to get into a dirty job to help out. My favorite scene in the film involves these two actors, and that would be the montage of Oscar having a good time with his co-workers and his wife dancing almost naked in front of lusting men. Their portrayal of the said scene will stop your heart from beating. Jake seems to be laughing heartily during the scene but after looking deeply into it, he really seems to be crying. Althea was trying hard to please and entertain her audience, but you’ll feel in her performance her character’s deep sadness. Meanwhile, the other brilliant actor in the film is John Arcilla, who intensely portrays Oscar’s partner/senior officer in their company. He breathed and looked the part he was assigned to portray. The supporting cast is also good, and they’re part of the reason why the whole movie seems real. If there’s one recent film about the Philippine capital that you should see, it’s this movie. Who knows, maybe it’ll open up your eyes to the reality the bright lights and pleasing sounds of the metro are trying to conceal. Insidious 2 is a solid horror movie that gives the chills with its memorable dialogues and scary antics. I liked the first Insidious movie. I remembered it as starting slowly, then building up to tell a suspenseful story and ending superbly well. Insidious 2 continues the story of the original and augments it with flashback scenes. Josh Lambert (portrayed by Patrick Wilson), the husband and father who is revealed to have the gift of astral projection in the first movie tries to start a new life with his family. He is cleared from the death of Elise, the clairvoyant woman who helped them take back his son who’s lost in the spiritual realm. However, Josh’s wife Renai (Rose Byrne) still experiences some supernatural things that make her doubt everything around her. With the help of Josh’s mother and Elise’s friends, she tries to unravel the truth about the events surrounding her family. I like how the writer and the director intertwined the stories of the two movies as they tried to make sense of some scenes from the original. But this doesn’t mean the sequel is all crystal clear. Like the first movie, some of the scenes in the sequel are blurred or confusing to say the least. There are also parts when nothing seems to be happening and everything is just a ho-hum. But when things begin to make more sense and some more frightening things start to happen, the movie is so much enjoyable (or cringe-worthy, depending on how you react to these kinds of movies) until the satisfying end. Majority of the cast is good. Patrick Wilson, who seems like a part of every horror movie being shown in the theaters, is at it again. He is able to set himself as the hero and villain in his portrayal of Josh Lambert. But the artists who really stand out are Rose Byrne, Josh’s wife who’s terrifying reactions to terrible scenes are worthy of a second look; Danielle Bisutti, the horrifying mother of the ghost possessing Josh; and Tom Fitzpatrick, the crazed ghost possessing Josh, Parker Crane. In terms of casting, the only memorable gaffe is the bad comic timing of the two actors who are supposed to provide the comic relief. Sometimes, their scenes board on awkwardness that doesn’t bring out the laughs they intended to bring. What I like best in the movie is its screenplay. The writer, Leigh Wannell, produced memorable dialogues that could still be remembered for years to come (most memorable: Marilyn). The plot is not original, but the twists in the movie are so good you would want more (Last time I checked, there is going to be a 3rd Insidious movie, so rejoice if you’re a fan!). In the hands of the acclaimed horror director, James Wan (Saw, Insidious, The Conjuring), the intertwining plots of the past and the present are brought to life in scary and crazy good ways. The turnover of scenes is good and the execution of the scary scenes is crazy good. If both writer and director are still in the third Insidious movie, count me in because I would certainly be watching.